It started as a search for a decorative window and turned into a hobby. Discover how this Crystal Lake artist turned her passion into a business and a creative workshop for other glass artists. 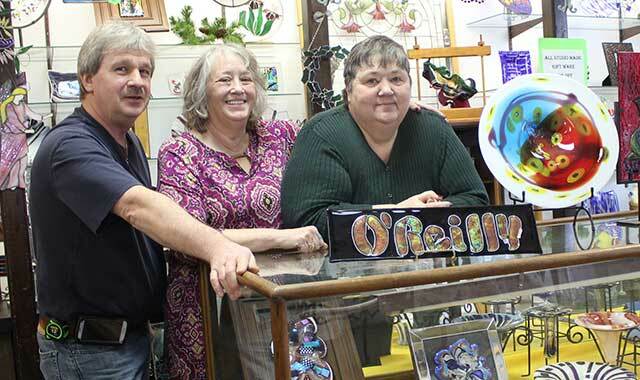 Suzie O’Reilly, far right, shows off her colorful store with employees Glenn Anderl and Kathy Goldberg. All it took to get Suzie O’Reilly hooked on stained glass was a search for a decorative kitchen transom window, nearly 36 years ago. “When I ordered the window and learned that the artist who created it was going to start teaching, I talked my two sisters-in-law into joining me in the classes,” says O’Reilly. She went on to learn about glass fusing and related techniques, eventually becoming certified in several aspects of stained glass. O’Reilly’s enthusiasm prompted her to share with others, teaching classes in a home studio through McHenry County College. “As a mother of four, I found that working with glass in my basement workshop provided good mental therapy and a creative outlet that developed into a true passion,” she says. As demand for her classes continued to grow, she took the next logical step in 1999 and opened O’Reilly’s Stained Glass at 58 N. Williams St., inside an historic building in downtown Crystal Lake. Today, O’Reilly’s store carries a wide assortment of stained glass supplies for craftsmen, along with glass giftware including vases, bowls and platters, all made at the shop. Customers come from Crystal Lake and outlying communities as well as Wisconsin, Indiana and Iowa. A big draw is the shop’s extensive collection of bevel clusters for stained glass and glass doors, windows and transoms. It also stocks a wide selection of antique and art glass. Although she doesn’t always stock certain big-ticket items, O’Reilly always offers to help customers locate whatever supplies – big or little – that they need. Johnsburg resident Karl Krause, a longtime customer, enjoys the vast selection. “If she doesn’t have what you need, she can probably get it,” he says. Many customers load up on stained glass for projects they will complete at home, while others request one of O’Reilly’s handmade designs. To accommodate a broad spectrum of customer needs, O’Reilly’s also creates custom transoms and decorative pieces for the home. Another customer commissioned a religious window as an anniversary gift for his wife. O’Reilly’s produces a number of wedding-related keepsakes as well, such as bowls for centerpieces, and what she calls “the wave,” a personalized stained glass piece with the customer’s name in elevated relief, and often set atop a special-occasion cake. In addition, she designs decorative pieces for baby showers and bar mitzvahs. O’Reilly and her team of three maintain a busy class schedule, typically conducting lessons four days a week. Students learn the ins and outs of manipulating molten glass in an open kiln, as they form drop vases and other uniquely designed art objects from dichroic, or multicolored, glass. Other classes focus on reproducing scenic memories in glass. Sessions on making ornaments known as glassgloben are popular during winter, when students especially enjoy turning out angels and holiday wreaths to give to family and friends. Another popular class focuses on bead making, for crafters who incorporate them into necklaces and jewelry. “We also teach mosaics and have offered instruction on glass stepping stones, although the latter isn’t as popular as it used to be,” says O’Reilly. Classes require a minimum of two students and are scheduled based on demand. Students range in age from 14 to 87, and many have forged friendships after seven to 10 years of classes. The latest trend in glasswork is “painting” with frit, a pre-crushed fused, or calcined, glass. Though the frit technique has been around for a long time, it has become increasingly popular with hobbyists over the past three to four years. O’Reilly’s students work with various grades of crushed glass: powder, fine, medium and coarse. As soon as he walked in to O’Reilly’s, Krause knew he had found what he was looking for. Krause has since come to value O’Reilly as a knowledgeable stained glass teacher, someone with whom he can easily discuss project ideas. His first creation was a snowflake, an introductory piece to get students acquainted with working with stained glass. Then, Krause created a pair of sidelights that he could insert on each side of his front door. Today, Krause relishes tackling projects that are personal to him, and over the years he has shared his love of stained glass with his family. One of the first gifts to his two children was a set of initialed and dated stained-glass casement windows. He also enjoys making votive candleholders of all styles. Nearly a decade after she launched a business from her stained glass hobby, O’Reilly has no regrets about the welcoming destination she’s created from personal passion. This entry was posted on Friday, January 24th, 2014 at 11:58 am	and is filed under Northwest Business Magazine. You can follow any responses to this entry through the RSS 2.0 feed. Both comments and pings are currently closed.